Microsoft SharePoint is widely used web-based application integrated with Microsoft Office suite. It is highly popular among the large organizations. One can use SharePoint as a secure place where one can store the important and confidential data. A user can also access and share the information stored in SharePoint from multiple devices for this only web browser is needed. With the help of SharePoint, one can also manage and control the entire content of his/her business. For Example, if a person is running a business then he/she must know that it is very difficult to protect the business from security violation or hacking. If data is hacked then a company has to face a serious damage. With SharePoint one can track the online content and streamline the various business process with ease. Moreover, SharePoint has an ability to organize documents and edit them easily. One can organize documents in SharePoint by using multiple criteria offered by SharePoint. Also, one can perform the collaborative editing by using the applications available with the software. 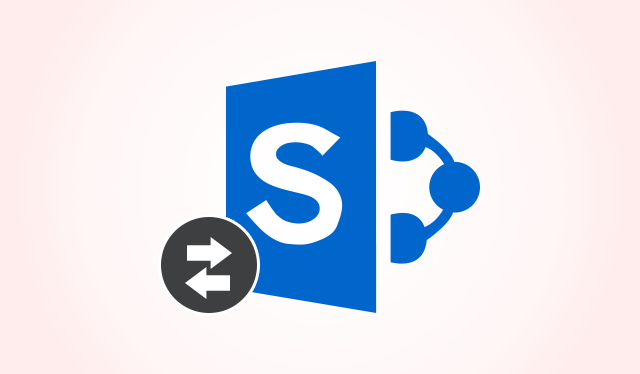 SharePoint platform is used by many users to access document and work spaces which a user needs to share with different individuals such as databases etc. But sometimes the situations occur in which SharePoint users often face failure or crash due to numerous reasons. Such actions take place due to the corruption in SharePoint database. A user is not able to access and open the database file until he/she repairs it. When a user tries to repair a highly corrupted SharePoint file then he/she might face challenges. Many users face data loss issues while repairing the database. 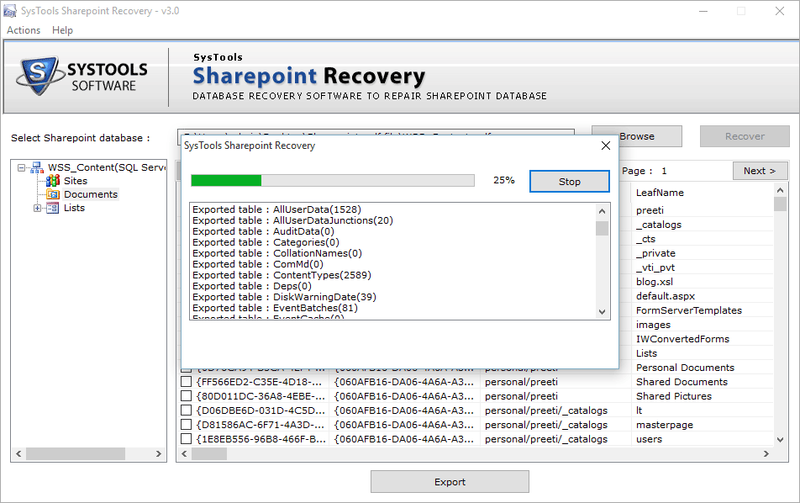 So, to avoid all the worse situations one must use a smart approach that is SharePoint Database Recovery Software. 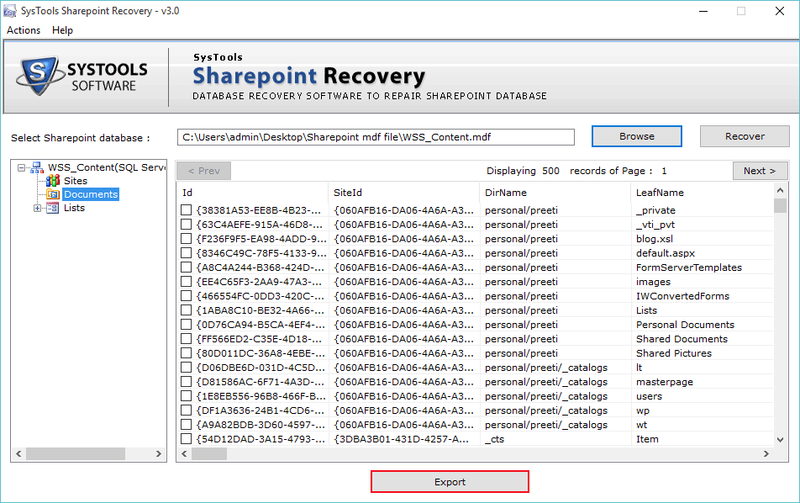 SharePoint repair tool is an efficient utility developed to recover and export the corrupt SharePoint database (.mdf) into SQL Server. This software can recover the complete SharePoint database that includes Triggers, Functions, Rules, Lists etc. Moreover, it has many advanced features like Quick Scan option, one can also preview database items with their properties, it has option to recover files from SharePoint database. This utility permits to export data into SQL Server 2016 and all the below version. Unable to connect to the database. Check database connection information and make sure the database server is running etc. With this software, one can repair corrupt SharePoint database from the server corruption issues. It can restore various items present in SharePoint database likes sites, lists, alerts, workflow state, documents, associations, permissions, custom views Web part links etc. The SharePoint recovery database tool also helps to overcome the corruption caused due to Virus attack, Trojan infection etc. 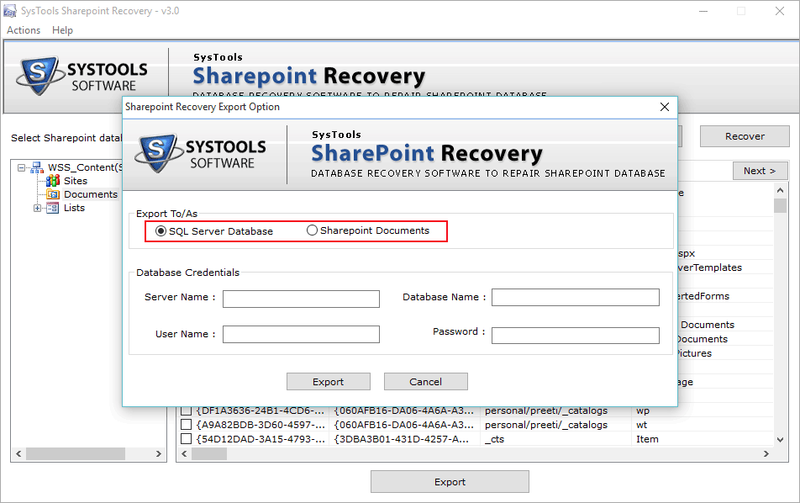 This utility provides an option to export the recovered data in two different outputs that are: Save data in SQL Server Database and extract SharePoint documents. A user can directly export SharePoint to SQL Server with the help of this utility. For this user must have the SQL credentials. On the other hand, SharePoint recovery tool also provides an option to save all the SharePoint documents in new .mdf file. 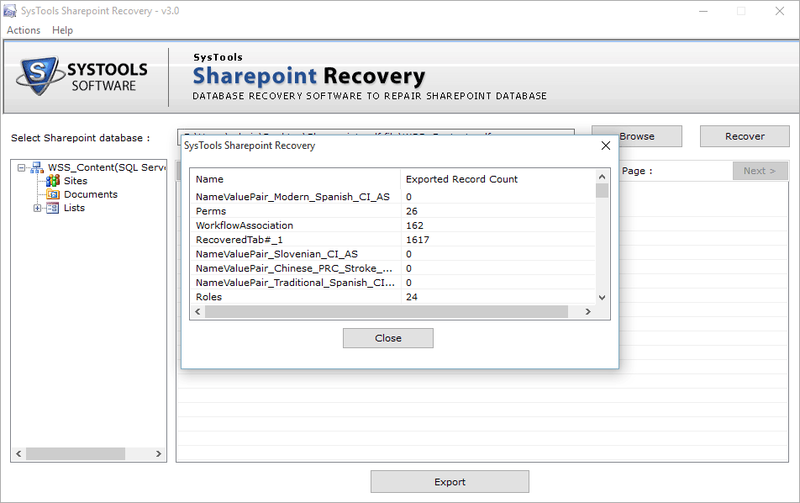 A user can scan the complete database via SharePoint repair tool. It also provides an option to view a summary report of the process. All the details related to MDF file like Database name, count of tables, pages read, database version, rules, functions, stored procedures etc. are present in this summary report. 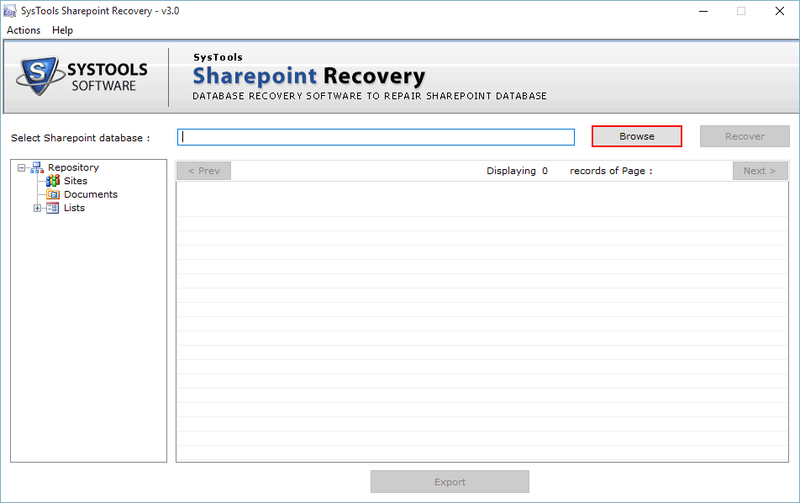 The SharePoint recovery tool allows a user to perform quick scanning of files in order to recover the database. Once the scanning process is completed a user can preview all the items with their associated attributes. Some of the attributes are Site ID, directory name, Full URL, Leaf Name, Parent web etc. A user can select the items to be exported from the recovered database by checking or unchecking the items. This makes easy for a user to filter the data according to his/her requirements. One can save the limited amount of data rather than saving the unwanted data. Even users can export or migrate recovered SharePoint data to SQL Server or to Sharepoint document library. Sometimes, different types of error messages appear when a user is accessing the SharePoint database. So, with the SharePoint database recovery tool, one can overcome any of the error messages that occur. One can eliminate errors like ‘The list cannot be displayed in datasheet view’, ‘The file cannot be opened’ and more. 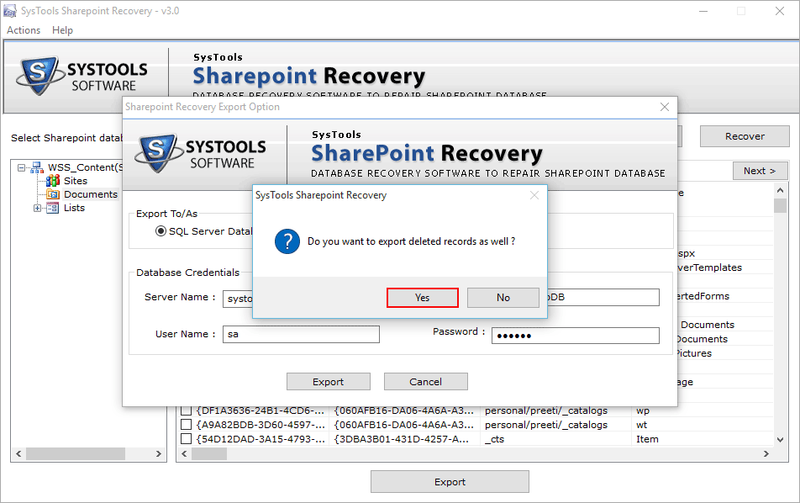 First, you have to download and install SysTools SharePoint Recovery tool on your system. Click on the ‘Recover’ option to start the recovery process of SharePoint database. 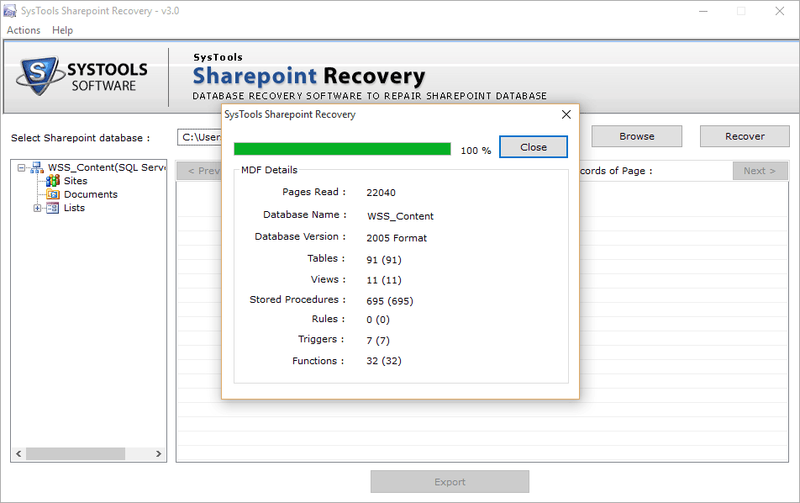 SharePoint Recovery Tool is an easy-to-use and efficient product. With this utility, one can export and repair corrupt SharePoint Database (.mdf) into SQL Server in an effortless way. Both technical and non-technical person can work with this tool as it is designed with a user-friendly interface. Besides recovering the SharePoint database it also has many advanced features like Quick scan, preview items, eliminate error messages etc. Moreover, there is no risk of data loss associated with this utility. It can be rated as 9.8 out of 10 due to its amazing features. It is a perfect and instant solution for all the users who want to recover and export the damaged Sharepoint database into SQL Server.